This is the third Hay House tarot or oracle set I've reviewed in the past month, and I saved my favourite for last. The Sacred Traveler Oracle Cards by Denise Linn really does it for me. The concept of the deck, which comes in a sturdy box with a book, is that each of our lives is a spiritual journey and a quest for self-discovery. We are each the hero of our own mythic adventure. Our way may be fraught with uncertainties and struggles, but we have a companion to guide us - our higher self (or guardian angel if we prefer to call it that). The artwork shows fairy-tale-like images that are beautiful and full of symbolism. The messages on the cards are inspiring while the longer meanings given in the book are helpful and practical as well as suggesting ways to view our life events as part of our own mythic story. The book recommends a short ritual to perform when using the cards. This includes cleansing yourself, the space and the cards, setting up sacred space and getting in the right frame of mind to do a reading. These steps can help you get the most from any divination deck and are worth practising. There are secret messages all around you; it's simply a matter of being able to hear them... 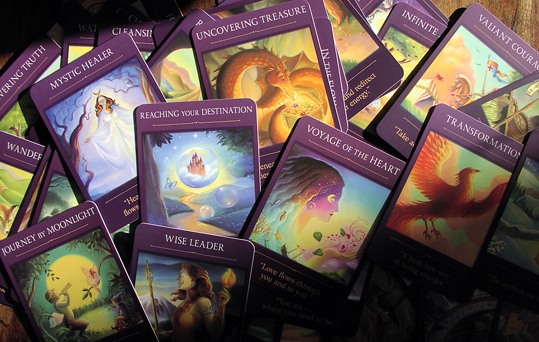 These Sacred Traveler Oracle Cards assist you to step behind the mystic veil into hallowed dimensions that will align your inner spiritual existence with your outer life. Each card interprets the signs that are around you and deciphers the secret messages of the universe..
To underline just how good I've personally found the cards, I thought I'd end this review by describing something rather unusual happened when I first used the Sacred Traveler deck. I shuffled for several minutes and drew a card. I put it back and did that again. It was the same card. I tried a third time, shuffling for longer. The same card thrice. Only once before in my life have I drawn exactly the same card three times in a row and that signified something very important was happening. I spent some time mulling over the message this card was giving me and came to the conclusion that it was something I had been trying to ignore, but in doing that was experiencing a bit of a creative blockage. It wasn't anything really bad - just an indication of an important change I need to make in the future, but when a deck gives me such a powerful reading, I know it is one I'm going to be using a great deal. You can view the Sacred Traveler Oracle Cards on Amazon. Denise Linn's book of guided visualisation, 33 spirit journeys, is one of the free audiobooks being offered by Hay House this month. You can find out more here: http://www.go.hayhouse.com/audiobook-giveaway? I love the look of the art work.